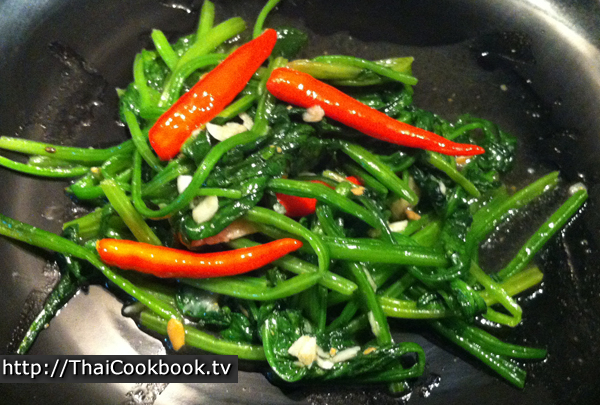 This simple yet delicious stir fried vegetable side dish made with Pak Boong (ผักบุ้ง; Water Morning Glory; Water Spinach) is one of Thailand's most popular foods. 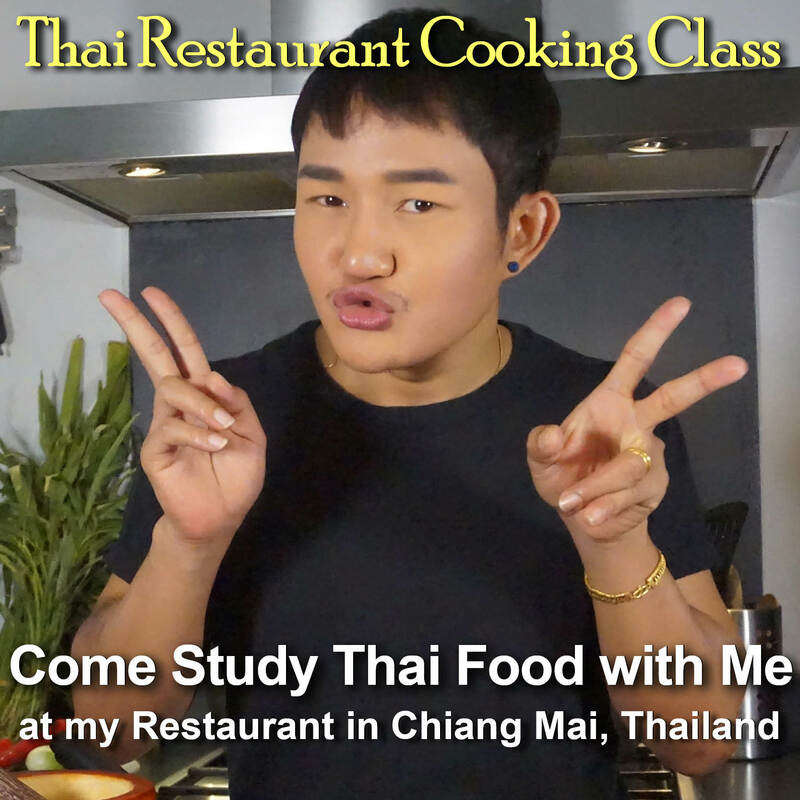 We think it should be on every first-time visitor's "must eat" list, as it is difficult to find at restaurants in the west. Seasoned with soy bean paste, garlic, chilies, soy sauce, and oyster sauce, the salty-spicy-sour-and-crunchiness of Pad Pak Boong Fai Daeng is great as a side dish or all by itself. 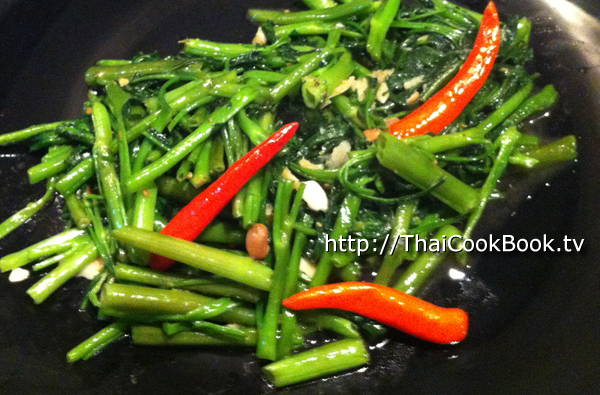 What's in our Stir Fried Morning Glory. 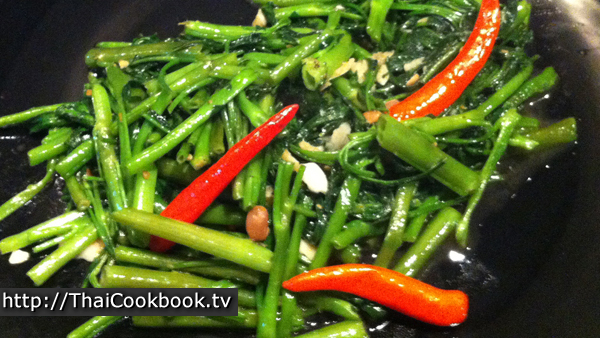 How we make our Stir Fried Morning Glory. 1) Cut the morning glory into 4 inch long pieces and place it in a bowl. Then measure the sauce ingredient and also put those in the bowl. Break up the garlic and chilies and add them to the top of the bowl. 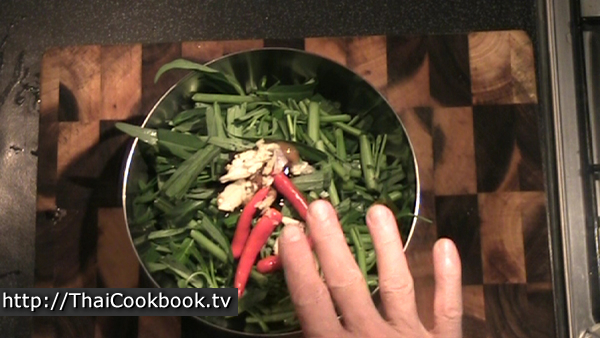 2) Heat the oil in a large wok until very hot, then all at once add the contents of the bowl. 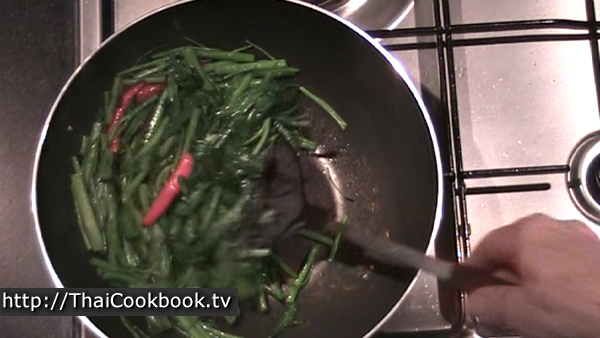 Stir and fry quickly, turning for the bottom until the morning glory is wilted. Clean the Pak Boong, then cut into 4 inch long pieces, leaving the top section and leaves a little longer. 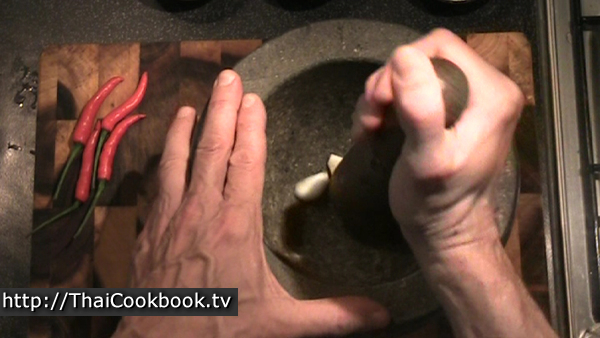 Using a mortar and pestle, or a garlic press, break up the garlic into small pieces. 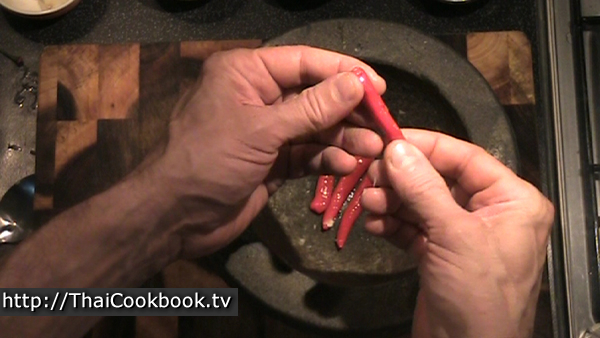 Break the chilies open, just enough to let some of the juices come out, leaving the body of the chili intact. Put the Pak Boong into a bowl, then put all the other ingredients except the oil on top. 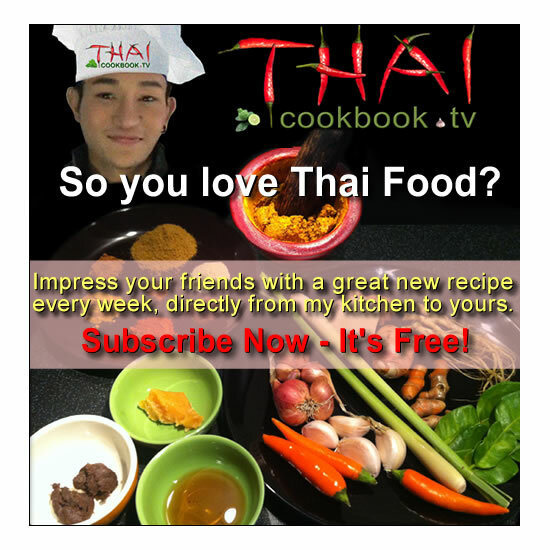 Heat the oil in a deep frying pan or wok until it's really hot, but not burning. Dump the bowl of ingredients up-side-down into the pan, so that the sauces are on the bottom. Quickly stir it up so it cooks evenly. It only takes a minute or so to cook, so be careful not to leave it on the heat too long. You'll know it's done when the the larger leaves are getting wilted, but the stalks are still very stiff. 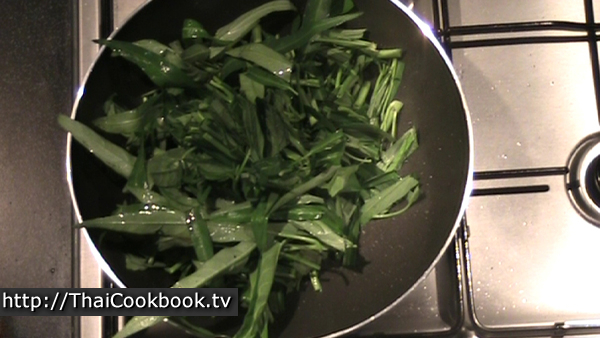 Alternate recipe: If you can't find water spinach in your area, try this recipe using regular spinach. It looks about the same and taste very similar.